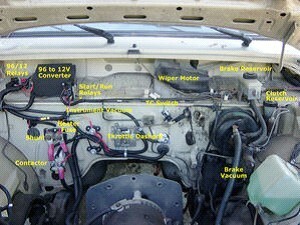 An electric vehicle conversion is the modification of aconventional internal combustionengine (ICE) driven vehicle to battery electric propulsion, creating abattery electric vehicle.Much of the information in this article is also applicable to thedesign and construction of electric vehicles from materials andcomponents, as is commonly done by hobbyists assemblingkit cars with ICEengines. While some conversions of internal combustion engine (ICE) vehicleshave been performed by major automobile manufacturers in the UnitedStates, all such programs have been terminated due to (to quote themanufacturers) "lack of consumer demand" for these vehicles. A fewspecialty rebuilders offer new or remanufactured conversions tosatisfy a rather limited demand. The demand is low primarily due tothe costs of completed vehicles, which are up to twice that of acomparable ICE vehicle. Some of these are built on new vehicles,purchased from the original equipment manufacturer but without thevarious ICE components. This article is concerned mainly with the hobbyist conversion ofICE vehicles to electric propulsion. It is not intended to be acomplete instruction manual, but rather a general guide toperforming your own conversions and for purchasing or modifying anEV conversion. Some representative types of vehicle conversionswill be presented. In this article "electric vehicle" (EV) refers to varioushobby conversions, not to high-end manufactured vehicles. Also,only technologies available to the hobbyist are considered indepth. Branded products may be illustrated where such are commonly used inEV conversions. This should not be considered to be promotional oran endorsement, which otherwise might be considered to be inviolation of Wikibooks policy. Note the presence of hazardous materials and conditions thatmust be approached with proper precautions and procedures to avoiddamaging, injurious, or even fatal consequences. Range is adequate if not the only vehicle in household or if longcommutes are not required. Fans point out that most trips innon-commute vehicles are for shopping, school drop-off/pick-up,visiting, and other errands within a 10 to 20 mile (15 to30 km) radius. 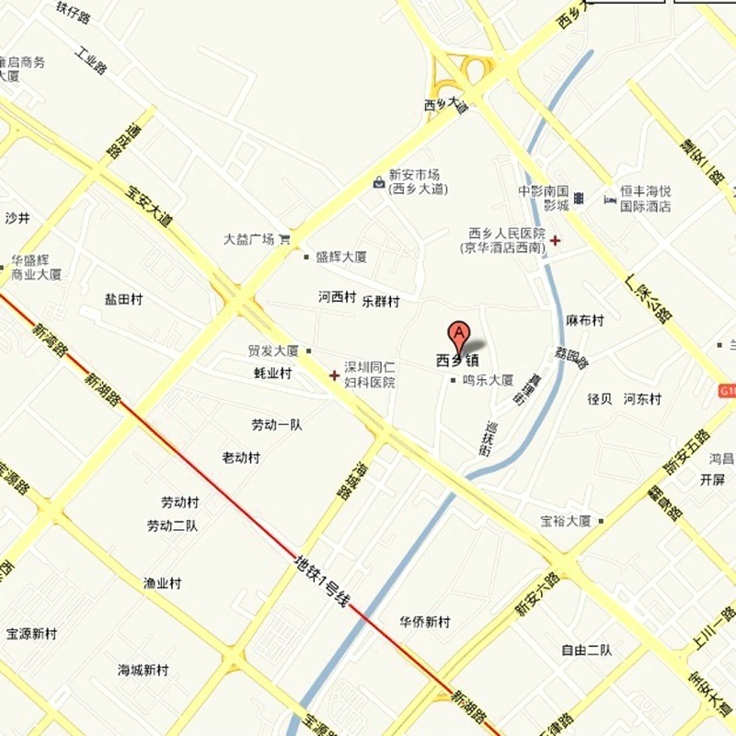 Long range is simply not needed for such trips and anoperating range of 30 to 40 miles (50 to 65 km) is quite sufficient. Fueling at home requires but seconds to plug in for overnightcharging followed by a few extra moments in the morning. Some findthis to be more convenient than driving to obtain gasoline whoseavailability and cost is less predictable. The homeowner can install on-grid solar photovoltaic rooftop poweror residential wind generation and so produce most of the energyrequired for personal transportation with zero pollution. Since thevehicles can be charged during low demand times the photovoltaicsprovide a larger societal benefit by helping to satisfy local peakdemand, greatly reducing overall pollution and reducingtransmission line loads. Additional benefits can also flow to theuser through time sensitive pricing/payback schemes, significantlyreducing the cost of a system that will support transportationneeds. Once a commitment to producing power is made it becomes aneasy decision to commit to producing all household and localtransportation power needs. Thus there is a societal benefit fromelectric vehicles beyond transportation. Electric vehicles are quiet. Even if not completely silent, they donot produce the low frequency rumble that can easily penetratehousehold walls and windows. Owners take pride in the non-polluting nature of their vehicles.Some point out that knowing that your vehicle is non-pollutingquickly leads to a realization how stinky and noxious even modern,well tuned non-electric vehicles actually are — something thattends to be ignored when you are part of the problem. Some EV fans with a left of center political bias or of a "green"inclination claim that when combined with household photovoltaics,electric vehicle users are not assisting (through their fuelpurchases) despotic governments in oil-rich countries, nor thepolitically powerful companies that prepare and distribute theirproducts, nor the politically powerful coal interests, nor thedomestic politicians that serve and protect these companies andcountries. Many electric vehicle owners and operators express greatsatisfaction in this aspect of electric vehicle use, even whileacknowledging that this use can have only little effect on thesematters unless adopted more widely and produced in greaterquantities. Some EV fans with a right of center political bias believe that EVswill free the country from foreign sources of energy to onesdomestically produced. This can make a country less strategicallydependent on non-democratic oil-rich countries likeSaudi Arabia. Some USA EV fans have accused the three major domesticmanufacturers, GeneralMotors, ChryslerCorporation and Ford MotorCompany of deliberately sabotaging their own electric vehicleefforts through several methods: failing to market, failing toproduce appropriate vehicles, failing to satisfy demand, and usinglease-only programs with prohibitions against end of leasepurchase. They also point to the Chrysler "golf cart" program as aninsult to the marketplace and to mandates, accusing Chrysler ofintentionally failing to produce a vehicle usable in mixed trafficconditions. The manufacturers, in their own defense, have respondedthat they only make what the public wants. Of the various electricvehicles marketed by the "Big Three", only the General Motors EV1 (manufactured by GM) and the Th!nk City (imported and marketed by Ford) came close to being appropriate configurations for a mass market. However, at the end of their programs GM destroyed its fleet, to avoid the continuing expense necessary to continue to provide maintenance and support for these vehicles. Ford's Norwegian-built "Th!nk" fleet was covered by a three-year exemption to the standard U.S. Motor Vehicle Safety laws, after which time Ford had planned to dismantle and recycle its fleet; the company was, however, persuaded by the Norwegian Government and others to not destroy its fleet but return them to Norway and sell them as used vehicles. Ford also sold a few lead-acid battery Ranger EVs and has allowed a small percentage of lease returns into a limited market (after crushing and destroying 90 percent of the fleet, without saving any components), and some fleet purchase Chevrolet S-10 EV pickups are being refurbished and sold on the secondary market. Both Honda and Toyota also manufactured electric only vehicles. Honda followed the leadof the other majors and terminated their lease-onlyprograms. Toyota offered vehicles for both sale and lease. While Toyota has terminated manufacture of new vehicles it continues to supportthose manufactured and is allowing for some institutional leasereturns to be placed in the marketplace. It is actually possible tosee a RAV-4 EV on the roadbut this is indeed a rare sight. Why convert or purchase a converted ICE to get an electricvehicle? In Europe and some partsof Asia vehicle buyers have the choice of ICE or electric - it is actuallypossible to obtain reliable, well engineered and road-worthyelectric vehicles and to have them maintained by a dealer. Otherthan for a beginning market for Nei***orhood Electric Vehicles (NEVs), isnot possible in the United States for economic, political, andmarket-restraint reasons. Nor is it possible for a person to easilyimport a new electric vehicle from Europe or Asia. Certain restrictive safety regulations (such as the requirementfor safety glass ratherthan tempered glass inwindshields, airbagrequirements, lighting regulations, plus the destructive testing bybarrier collisions all operate to inhibit the use of offshoremanufactured vehicles. In contrast there are few restrictions onthe personal conversion of an ICE vehicle to BEV (battery electricvehicle). This anomaly is distinctly cultural in English speakingNorth America and is emblematic of a dichotomy in the Americanpolitical psyche: On the one hand, social and political pressures force the government to protect consumers in the marketplace from exploitation by corporations and large corporations prefer legislation that restricts the entry of new players into the marketplace, while the preservation of individual freedom to tinker in one's garage or workshop is considered sacred, being in the spirit of great inventors such as Edison and the Wright brothers. Note that battery technology is rapidly improving incost/performance ratios due to the use of batteries in ICE-electrichybrid vehicles. The EVthat is converted today will be upgradeable by future battery (andperhaps charger) replacement. Beginning in the 1990s, the California Air Resources Board waslooking for a way to combat air pollution and when General Motorsbegan work with their EV1 it caught the attention of theAir Resources Board (JananneSharpless, Who Killedthe Electric Car Interview). They also saw that thestate was spending over $5 billion on air pollution-relatedillness. There was also a study done in 1989 that reported one outof four 18- to 25-year-olds had severe to moderate lung lesions.The Resources board eventually passed a mandate that stated by2003, 10% of all vehicles sold in the state would be zero emissionvehicles (ZEV). Toyota, Honda, General Motors, Ford, and Nissan all built limitedproduction runs of battery-powered vehicles. For a variety ofreasons; some say lack of advertising from the original equipmentmanufacturers (OEMs), others say the lack of purchase (they wereonly available by closed-end leases); still others say that thelimited production runs kept costs too high to make them affordableby the average buyer. Almost all of the leased cars were collectedat the end of their lease and then destroyed, despite theprotestations of willing buyers. The CARB charter was notnecessarily intended to drive up the production of electricvehicles, but rather to reduce air pollution. The manufacturerssuccessfully argued for changes to the rules. The CARBspecifications were modified from zero emissions to an equivalentemission reduction by the mandated production of very low emissionvehicles, SULEVs (SUper LowEmission Vehicles) — vehicles producing about one tenth thepreviously mandated emission levels. This effectively created ahole in the mandate, because the U.S. Federal Government is theonly governing body allowed to "mandate" MPG; these are called CAFEstandards, they also have not changed (until 2008) since the oilembargo of the 1970s. Later on, GM, followed by DaimlerChrysler andseveral dealerships, would sue CARB. It would not be until theFederal government would come on board, as well as the Bushadministration, to help kill the electric car. Not much later,President Bush would commit more than a billion dollars to hydrogenfuel cells, while totally ignoring current and past 170-year-old EVtechnology, established by analysis to be far more efficientsource-to-sink than the proposed hydrogen schemes. In general, you should not attempt to maintain and operate a "homemade" electric vehicle unless you have some interest and perhaps atleast modest skills concerning mechanical and electric devices.Such skills are difficult to come by in many states due to thegenerally low volume of shop and industrial arts classes in currentintermediate and high school programs. However, if you are the kindof person who will at least take apart a malfunctioning smallappliance, and can sometimes at least identify the problem (e.g.,needs regreasing or new motor brushes) you should have littleproblem with maintaining an EV. A professionally built conversion will often be designed to beignored, being engineered, constructed, and tested to survive withonly minor maintenance on the operator's part and regular charging,combined with a regular professionally performed maintenanceschedule. On the other hand, a non-professional conversion willprobably require regular inspections of details like battery andmotor electrical and mechanical connections, security of auxiliarysystems, and inspection of wires and cables for chafing and looseconnectors in order to avoid more extensive problems. While thesetasks do not require a large amount of time, this time is more thanis usually required of a conventional internal combustionvehicle. The direct operating costs will generally be confined to expensesfor tires, battery replacement, battery water (where required), andelectricity for recharging. Although the cost of electricity forcharging these vehicles is generally much less than the cost offuel for ICE vehicles, the cost of battery replacement can be veryhigh. In general, the overall cost per mile for an EV —including periodic battery replacement — may be greater orless that for a conventional ICE vehicle of similar size andperformance, depending largely upon the battery type used. Forexample, if the cost of electricity is (US) $0.12/kWh, the batterypack costs $1200 to replace (a low cost based upon the lowest costtechnology), and lasts 20,000 miles (an optimistic number whenusing lead-acid batteries), and the vehicle uses 400 Wh/mile (arather high number), the combined cost per mile will be($960+$1200)/(20,000 miles), or less than $0.11/mile,comparable to an ICE vehicle getting 25 mpg at a fuel cost of $2.75per gallon. This does not count avoided costs, such as engine oilchanges (about $0.01/mile), smog inspections (about $0.002/mile),and various repairs required to maintain smog certification (whichcan be costly on an older ICE vehicle, probably between $0.005 and$0.015 per mile ), so the costs are currently roughly comparable atcurrent fuel prices. With more expensive gasoline or the use ofmore expensive but longer lasting batteries, the costs furtherfavor the electric conversion in the long run. Since converted vehicles are usually of an older vehicle, suchvehicles may need other maintenance due to accumulated wear,perhaps wheel bearings, brakes rotors or drums, brake pads orshoes, suspension bushings and the like, and other components thatare not usually replaced, but keep the vehicle up to date and showpride in ownership such as upholstery, door seals, and body paint.Such work is generally not cost effective in an ICE vehicle ifperformed by hire, while an interested hobbyist may do much work atquite modest cost and obtain substantial enjoyment in learning andperforming various craft skills. While a worn ICE vehicle of comparable condition would be simplyscrapped, you will likely want to maintain and even improve yourconversion, so you should consider maintenance (and evenimprovement) expenses to be a normal part of maintaining anolder vehicle. A more common vehicle may be cheaper to maintainwhen in the seven to twenty year age range than a rare, specialinterest, or very old vehicle due to the availability of low costusable parts from automotive recycling yards. Some special interestvehicles have enabled the creation of a robust secondary partsmarket, although such vehicles are generally best left as ICEvehicles, unless especially suitable for conversion to electricpower. A wide range of skills is needed by a converter of a vehicle.Fortunately, there will often be fellow EV enthusiasts in an areathat are willing and able to assist the novice builder. A builder should be able to identify problems in a potentialconversion vehicle. These are the same skills required to identifyand purchase a good used ICE vehicle and are especially useful if aconversion (complete or partial) is purchased from another builder.Note that it may be possible to purchase a used EV conversion thatonly needs batteries - the owner may want to build another vehicleusing the proceeds from the sale of an earlier conversion but notwish to invest in new batteries for a vehicle about to be sold. Acareful survey of such a vehicle will go beyond that stated aboveas it is very important that latent electrical defects beidentified and corrected, e.g. : the presence of chafing points inthe electrical system that could lead to short circuits and anawareness of the possible necessity for the addition of primary orsecondary electrical and operational safety equipment andcircuits. A builder should be able to fabricate small brackets for mountingsensors, switches, and relays. This can be done using simple handtools - a small vice, hacksaw, shears, hammer, pliers, and variousdrills and files. Most machining requires expensive equipment and extensive skills.Machine shop skills will not be needed if the converter can obtain"off the shelf" components (components made to order from knownspecifications). In the case of exotic conversions the convertermay have to have specialized work done locally, or ship thetransmission to a specialty vendor. The more machine shop skills abuilder has the more work that builder will be able to perform, andwill be more skilled at selecting professional help. Creation ofthe motor coupling and the motor to transmission adapter usuallyrequire skills and experience of a high order (a typicalautomotive machinist will not usually be able to perform thework satisfactorily). A knowledgeable converter will be better ableto judge the qualifications of the machinist to be employed, and acooperative machinist may be willing to allow the converter toperform some of the lower skilled and lower risk tasks. It is alsoimportant that the machine shop tasks be well planned out andbroken down into the component subtasks, something that a converterof modest machine shop skills will be able to do. Work in a machineshop may be done at fixed price (in which case the enumeration oftasks will aid in bid preparation) or performed using an hourlyrate, in which case the estimate will be more accurate. For anexotic conversions where components must be designed a goodrelationship with a cooperative machine shop is essential tocompleting a successful and cost-effective project. 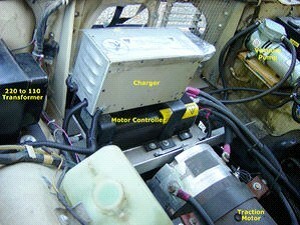 For conversion of a unit body vehicle it is especially importantthat the batteries be well secured. This is typically done bycreating racks from angle steel stock or boxes fromsheet metal welded into forms suitable for the batteries andvehicle. These racks or boxes are then welded to the unit body orsecured to the vehicle's frame (if accessable). This requires carein avoiding warpage of the primary vehicle structure . For popularconversions it is possible to obtain manufactured racks designedfor a pre-engineered layout, so this skill may be consideredoptional but dependent upon the vehicle selected for conversion.For light truck conversions with in-bed batteries no welding isnecessary - all retention may be done with appropriate boltedhardwood components. The ability to remove, disassemble, rebuild, and install major ICEcomponents such as transmissions, engines, and suspensioncomponents is useful but may be performed by a specialty conversionshop. The builder–owner should be especially cautious in theemployment of ICE auto mechanics for these tasks as they may beunfamiliar with specialized EV procedures and requirements. A builder should be sufficiently knowledgeable about basicelectricity to safely work on household and EV electrical systems.Note that an EV pack can provide extremely high currents, which canrapidly heat wires or misused tools, causing burns, and thatbatteries so overloaded can explode with consequent hazards of acidand toxic materials. Most traction packs and the associated highvoltage accessory wiring (heater and twelve volt converter) supplyor use potentially lethal voltages. Specific electricalarrangements are used to minimize the hazards present and it isimportant that the builder/operator observe proper precautions andmaintain the equipment in a safe configuration. While the systems used in EV safety are not exotic, the buildershould have sufficient skill to design and implement basic relayand diode logic for control and alarms. The smaller relays neededmay be obtained at a local electronics supply shop or through an EVparts supplier. Some specialty components are obtained from EVparts suppliers or sometimes from automotive partsrecyclers. Electric vehicles (EVs) are appropriate for short to medium rangecommuting. Longer ranges are possible if charging may be obtainedat both ends of the commute. EVs are appropriate for local errands where long range is notimportant. While Nei***orhood ElectricVehicles (NEVs, essentially enhanced electricgolf cars) are availablefrom several manufactures, such vehicles are not considered herefor hobby conversion as they are readily available frommanufacturers and are not suitable for most suburban locations(although they may be well suited for operation in some urbanenvironments and many self-contained communities). While almost any vehicle can be converted to electric power, oneshould be cautious about converting a vehicle simply because it isavailable (such as a family vehicle with a non-functioning engine).One should first consider the performance envelope that is bothdesired and affordable (see below) and then find a suitable vehiclethat will satisfy these needs when converted. A good used vehiclein running condition may be a better choice than a vehicle with amajor defect, as one can test the running components such astransmission, differential, suspension, and other components byroad test. If the parts to be removed are in good condition it maybe possible to obtain a good price by selling the engine while itcan be demonstrated in the vehicle. A purchaser will thus have someconfidence in the quality of the engine and may be willing to paymore than for one of unknown quality that has been removed from thevehicle. A later model may be available with advanced safetyfeatures and better brakes than would be available on a fifteen ortwenty year old vehicle. As a minimum, an EV conversion should have sufficient performanceso as not to impede conventional traffic operating within the speedlimits of the roadway. This does not mean that it is necessary toobtain a level of performance equivalent to an ICE vehicle,although a short range performance vehicle may be constructed whichwill significantly outperform ICE vehicles below 30 mph (50 km/h). Some designers point out that a specific type of electric vehicleoffers comfort, utility and quickness, sacrificing only range. Thisis called a short range electric vehicle. This type may be builtusing high performance lead–acid batteries, but of only about halfthe mass that would be expected to obtain a 60 to 80 mile range.The result is a vehicle with about a thirty mile range, but whendesigned with appropriate weight distribution (40/60 front to rear)does not require power steering, offers exceptional acceleration inthe lower end of its operating range, is freeway capable and legal,and costs less to build and maintain. By including a manualtransmission this type of vehicle can obtain both betterperformance and higher efficiency than the single speedtypes developed by the major manufacturers. Unlike the convertedgolf carts used for nei***orhood electric vehicles, these may beoperated on typical suburban throughways (40 to 45 mph or 70 km/h speed limits are typical) and can keep up with traffic typical tothese roads and to the short on and off segments of freeways thatare common in suburban areas. Relative to an ICE vehicle an EV can offer substantially lower costper mile in some applications but not all. An ICE can be very cheapto buy and maintain (until old and worn) but expensive for purchaseof fuel and for "smog"inspections and oil changes. An EV can be expensive to build and to replace batteries, yet quiteinexpensive to operate if the cost of electricity is low. An EV isespecially attractive if a homeowner has installed sufficientnet metering photovoltaic (solar electric) panels, particularly if the net metering applies time of use rates. Above: Bob Schneeveis demonstrates his Silver Sofa to thedelight of his passengers. 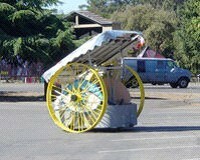 This can spin rapidly in place like acarnival ride and its batteries are recharged by the solarpanels. 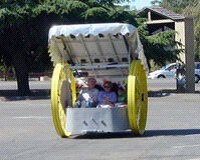 A novelty vehicle or an electric powered art car may not be suitable for on roaduse. Applications include electric vehicle show demonstrations,parades, parade floats, float towing, and eclectic off-roadgatherings such as BurningMan. A prelude to larger vehicles, intended for the education of middleschool students, these are fabricated from a standardised box ofcomponents, with the overall design and gear ratios determined bythe builder. A building team will typically consist of two studentsand an ***** advisor. 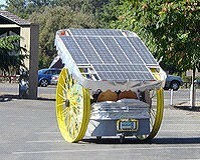 Suitable for educating youth in the technologies of electricvehicles, technically advanced versions of the cart can exhibithigh efficiency in energy use and are a natural prelude to laterdeveloping pure solar electric racing vehicles or the conversion ofICE vehicles to electric drive. Speeds are typically limited toabout seven MPH so a running ***** can overtake and stop a vehicle.Some classes allow a great freedom in design by having a classfirst disassemble the previous constructions, returning componentsto appropriate bins. This disassembly task informs the students ondesign methods and equiment assembly. The students, in small teams,then design and construct new vehicles. The ultimate in efficiency is exhibited by solar powered electriccars with highly refined chassies, electrics, and aerodynamics.These are designed and assembled by college teams with the supportof various businesses, especially those involved with solar power,batteries, electric propulsion, or automotive manufacturing.Competitions are traditionally biennial, with the most widelyrecognized event being the World Solar Challenge inAustralia, an 1800 mile race from Darwin to Adelaide. In the North American Solar Challenge teams race 2500 milesfrom Austin, Texas through Winnipeg, Manitoba finishing in Calgary, Alberta. An electric bicycle is a class of bicycles that are fitted with anelectric motor. Often they are powered by rechargeable batterieshowever some experimental electric bicycles run directly on orrecharge their batteries via solar panels, fuel cells, gasgenerators or other alternatives energy sources. Some experimentershave even used super capacitors to store energy. Using an on-boardgenerator may impact the legal juristictional definition of anelectric bicycle. A few types of electric bicycles are able tore-capture energy from braking and can re-charge the batterieswhile braking or travelling down hills (regenerative braking). Withthe advent of newer technology further features can beexpected. Some electric bikes have features where the motor can move thebicycle by itself if the rider chooses not to pedal, while othersrequire the rider to pedal at all times. 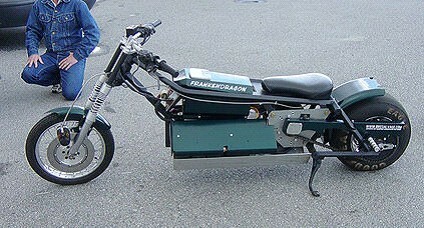 (see the Wikipedia articlemotorizedbicycle). The conversion of a bicycle to electric power is probably thelowest cost means of learning conversion methods. Battery packs are usually lead acid gel cells since these are available insmall sizes suitable for this application. It is also practical toexperiment with more expensive battery types since only a smallpack is required. It is possible to repurpose battery packs andchargers intended for powering toys and similar small electricaldevices. A specialty niche, this can offer an opportunity to build arelatively low cost electric vehicle. Most of these use a two wheelconfiguration, although the two types of three wheel vehicle (andsometimes four wheel vehicles) are classified as motorcycles inmany jurisdictions if their weight is sufficiently low (typicallyaround 1000 pounds maximum). If a tricycle layout is employed thesingle wheel should be at the back, with normal automotive typefront wheel steering, as the single wheel forward type isnotoriously unstable in handling. A light vehicle can make an excellent choice if care is taken incomponent selection and placement and use restrictions areaccepted. It is possible to obtain conversion kits for some popularlight vehicles, most notably the rear motor, rear drive Volkswagen"Beetle", its "Type 3" evolution, and its successor, the frontmotor/drive VW "Rabbit". One should not expect to convert such avehicle and then use it to transport four full size (or oversize)*****s - the cars simply do not have the safe load carryingcapacity for that. Instead, count on simply removing the rear seatto obtain space for light luggage. Rear wheel drive vehicles areespecially suitable for high performance applications as the weighttransfer due to acceleration will increase the traction on thedriven wheels. By converting a light vehicle it is possible to use a smallermotor, which both weighs and costs less than a larger motor.Lighter overall vehicle weight will reduce power consumption instart and stop traffic and so increase range in many practicaldriving conditions. Full size sedans and minivans are generally considered to be lessattractive candidates for EV conversion than smaller cars. It maybe easier to obtain upgraded components for some smaller vehicles,since these may be used for sports racing (particularlyautocross). Starting with aheavy vehicle and adding batteries will result in poor performancein acceleration, handling, braking, and economy ofoperation. For a person interested in sports car performance a satisfyingconversion will likely lead to a number of difficulties in suchdetails as battery disposition, as such vehicles generally haveavailable space distributed in small volumes around the vehicle.This leads to complexity in securing and wiring batteries. Suchvehicles can offer stunning performance in the lower speed rangesowing to light weight and rear wheel drive and may also offer goodrange from their superior aerodynamics. By far the most often converted sports car is the Porsche 914 fromthe early 1970's. An unusually robust chassis, combined with alarge interior storage volume for batteries has made this thevehicle of choice for many successful conversions. Light trucks are especially suitable for hobbyist conversion owingto the fact that it is easy to locate batteries remote from thepassenger compartment and there is a good load handling capacityfor the use of heavy batteries such as the flooded lead-acidbatteries commonly used in golf carts. Light trucks also offersubstantial utility in use simply because they are trucks. Even ifa portion of the weight capacity is removed by the presence ofbatteries within or below the cargo bed, much of the spacialutility remains. A light truck is highly recommended as a firstconversion effort owing to the simplicity of component layout.Furthermore, a light truck (being a utility vehicle) can reasonablybe maintained to a lower level of cosmetic standards - paint andbody work may be repaired to a lower standard of fit andfinish than would be expected for a sedan, coupe, or sportscar. (A simple light truck conversion example: Light trucks of theearly 21st century have outgrown their original design envelope,being made far taller and more bulky then needed. The last smalllight truck marketed in the early 2000s was the Nissan Frontier,now, in its current incarnation, "pumped up" with additional bulkand an unstable high center of gravity. The Toyota Hilux, whilestill manufactured, is not marketed within the USA. The most suitable light trucks for conversion are built onframes, and date from 1975 to the late 1990's and are almost allimport brands. EVs may prove to be especially suitable for autocross contests as low speedacceleration is especially important to success in this type ofracing. Specific classes for electric autocross (called"electrocross" )are being introduced in some venues. Vehicles forthese will typically be economy car conversions or custom builtchassies but with excess rear weight bias to allow agile handlingunder the control of an experienced driver (such rearward balancemay be dangerous for everyday use). Intended only for specialized straight line quarter mile(acceleration) racing this type of vehicle is used only "off road"at specialized "dragstrips". Suitable for a builder who is capable of constructing a kit car,with good abilities and equipment in machining and welding this canresult in a unique vehicle. It is especially suitable for theconstruction of a lightweight vehicle that can offer exceptionalperformance. These are rarely converted due to their excessive weight, andinefficiencies (namely due to poor aerodynamics). To make thesituation worse, many modern trucks/SUVs continue to get bulkierand heavier . As a direct result, the payload carrying capacity andthus the GVWR of thevehicles goes down. Such a trait is not desireable because itlimits the weight of the battery pack that can be carried, limitingthe maximum battery-to-vehicle weight ratio that could be achievedfor the vehicle when converted to an EV. For a given battery type,reducing the battery-to-vehicle weight ratio always results inreduced vehicle range per charge. However, despite these mostlyunavoidable limitations, several SUVs and larger trucks have beensuccessfully converted to electric power by hobbyists. Someexamples include the "Gone Postal"van converted to an EV racer by Roderick Wilde andSuckamps EV Racing, the 1971 LandRover EV converted by Wilde Evolutions, and the1988 Jeep Cherokee EVconverted by Nick Viera.